I treasure a nice, flavorful soup. In 2019, my goal is to make some soups that don't include tomatoes - it feels like I'm always pulling out two cans of diced tomatoes. That being said, there is something irresistible about a good, flavor filled tomato soup. And that is this one. I found the recipe trolling Instagram one day and was candidly drawn to the turmeric. I know the health benefits of turmeric are numerous. You won't get a whole lot healthier for eating this soup but it certainly doesn't hurt. The flavor is also not bananas strong so even picky eaters (ahem, my parents) would eat this and not even know. I ended up making this soup and giving most of it away to a 91 year old neighbor. I kept an itty bitty bowl of it for myself pretty much to validate it wasn't poisonous. The recipe does not yield a whole lot. It's really just enough for 2 bowls which might be perfect. Heat the coconut oil in a sauce pan and fry the onion and garlic for one minute. Add turmeric and cherry tomatoes, and cook until the tomatoes softens and leave their juices. Add the tomato can, vegetable stock, apple cider vinegar and basil, bring to boil, cover with a lid and let simmer for five minutes. Transfer into the blender and pulse to obtain a creamy liquid. Season with salt and pepper and serve garnished whatever suits your fancy. When I first moved into my new house, I brought with me 11 cans of diced tomatoes. It was nuts. Thanks to my recent run of soups and stews and chilis, I have many fewer cans in my inventory. In the near future I might have to add "diced tomatoes" back to my shopping list on the weekends. 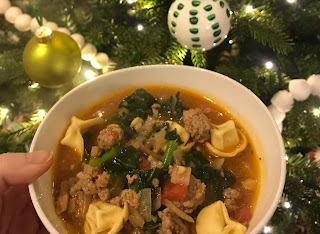 In continuing my "homemade Christmas" of 2018, I make my grandfather this soup. A couple months back he told me the San Diego is his favorite place. I didn't know of any San Diego soups but I did know Mexican food would be a good inspiration. And that's how we have a turkey posole soup. Posole soup is a traditional Mexican stew that normally calls for like a pork or chicken - but ground turkey is a healthier option. This soup can be very spicy if you want. I wasn't sure where my grandfather lands on the spicy spectrum so I held back. I swapped out the poblano pepper for a jalapeno but kept half the seeds. Compromises. Just like some soups and all chilis, this one is better the longer you let the flavors develop on the stove. You can see the broth deepen in color and become more opaque. Cook sweet pepper, onion and hot pepper in olive oil until onion is translucent. Add meat and cook until it is no longer pink. Drain off fat, if necessary. Stir in cocoa powder, oregano, salt, cumin, ancho chile pepper and cinnamon. Cook and stir for 1 minute. Stir in tomatoes, hominy, water and tomato sauce. Bring to boiling; reduce heat. Simmer, covered, for 20 minutes to blend flavors, stirring occasionally. Garnish with green onions and radishes. Serve with lime wedges. A couple days ago I made a list of all the leftover ingredients in my fridge and tried to figure out a way to use them - or just not waste them entirely. The list included: Christmas ham, sour cream, and radishes. Radishes are admittedly an odd one. I barely like them so this might just be a complete loss there. However, I can put the ham and sour cream to use in a savory scone. In the past I have made many scone varieties including a pancetta version in 2013. In 2014 I even used the pancetta scones to try and bribe a landlord for wood floors. These ham scones are definitely more of the savory spectrum. It's nice for breakfast but if I'm being honest I also had two at 8pm last night watching Office reruns. Ham // Although the ham was cooked, I sautéed it for a couple minutes to crisp it up a bit. Not needed but just a personal preference. Texture + Height // This recipe doesn't get the same height as previous scones but I took a few shortcuts. I think the mixture was a little too wet and I didn't keep the butter super frozen. That being said, it's hard to resist ham and cheese scones either way. Mix flours, sugar, baking powder, baking soda and salt together in a large mixing bowl. Add the shredded frozen butter to the flour mixture and stir to combine. In a small bowl, whisk sour cream, egg and vanilla until smooth. Use your hands to work the sour cream mixture into flour mixture until the dough starts to come together. Add in the ham and cheese and gently mix to combine. If necessary, add in some milk to moisten the mixture. Once the dough completely comes together, turn it onto a clean surface and shape it into a circle or rectangle. Cut the scones with a floured knife to the shape you desire. Put on a baking sheet, sprinkle with granulated sugar and bake until golden. Bake time will be between 15-25 minutes depending on the thickness of your scone. This post is heavily delayed but I wanted to write it none the less. I think this past summer's tomato varieties were the best yet. I almost wouldn't change anything except for the fact that I like trying new varieties too much. I got too busy last year and never wrote a 2017 recap, but here is the 2016 one. There were some real duds this year (ahem, Black Krim) but also some real winners. It'll be hard for me to not plant "4th of July" and "black truffle" every year. They are both so great. 4th of July is very productive but my favorite feature is the size. Black Truffle is always a showstopper both on the vine and on the plate. But, here is the real breakdown. All of these varieties were organically grown from seed in my garage - except the 4th of July. My dad grew that one right down the road. During my last analysis I rated tomatoes for uniqueness, production, and overall wonderfulness. In spite of my overall love of numbers and spreadsheets, there is potentially no correlation between these 3 ratings. I'm not a data scientist. black cherry (2017 graduate) // A little later to ripen compared to last year, but still amazing. Lots of fruit on the plant still but not nearly as productive as the other cherry varieties. I think its just a weird thing because last year I was swimming in black cherry tomatoes. midnight snack // total attention grabber. They are front and center in the garden so everyone sees them. The color is really beautiful and they are very tasty for a cherry tomato. It was a little confusing for guests because they just saw the purple tops and assumed they were ripe. Tomatoes aren't ripe until the bottom of them is red. sunrise bumble bee // very fun. if you can wait until they are just the tiniest bit orange/red, then they are the most delicious but still good a bit early. Shimmer // Really interesting. Like a black truffle and a san marzano had a baby. Wonderful color and more flavor than a san marzano. Incredibly productive. It was borderline disappointing because I ended up with so much wasted fruit at the end of the season. 4th of July // complete homerun. Ripened the soonest (early August). Perfect shape and size. Excellent early red tomato flavor. Perhaps not the most attention grabbing variety but the combination of size and bright red color is perfect. sweet tangerine // beautiful orange color. Not super juicy but a great sliced tomato. I always like to have one orange or yellow variety in the garden and this is a good option. Size is very much a beefsteak as the fruit gets quite large. black truffle (2016 and 2017 graduate) // Always a winner. Forever and ever. Technically the black truffle is a beefsteak variety but the size is much more approachable. It would be hard to pass up planting this in the garden every year. big rainbow // ripened very late into the season and not super productive. I only got 4-5 the whole summer ... but they were seriously beautiful. I might have sworn when I cut into the first tomato. It might be worth the gamble to plant this variety given how beautiful they are when ripe. black krim // I'm honestly not sure why everyone always wants to try this variety. Despite being fairly productive this year, the fruit was a bit gnarly in shape and more bug prone than the rest of the garden. I did enter one of the tomatoes in a local contest because it was just so big. I have no desire to try this variety again. I have watched a whole lot of "Great British Baking Show" this year... and one thing that seems pervasive on that show is people screwing up a rolled dough. In their defense, it is usually a sponge cake and that seems hard. But, I absolutely had flashbacks to the show when I was making these swirl cookies. Earlier in the week, we had a family baking night and the sugar cookie dough was next level delicious. Like nothing I've ever had before. Given my dad rarely bakes, I wasn't chalking this up to expert baking skills :-) ... After comparing that sugar dough and this one, I feel pretty confident in hypothesizing the difference was using powdered sugar over granulated sugar. Don't worry this cookie is still quite delicious. The orange is nice and subtle and the cranberry isn't offensive. We all know cranberry can be offensive. I'm 100% planning on doing this same recipe during blueberry season next year. Just imagine itty bitty blue swirls next 4th of July. In a mixing bowl add butter and sugar and mix until fluffy. Mix in vanilla, eggs, and orange peel. Add flour, salt and baking powder. Mix. When dough is well mixed, remove from bowl and form into two discs. Wrap each disc in plastic wrap and refrigerate for one hour. In a food processor add cranberries, orange juice, sugar and orange peel. Process until finely chopped. Carefully roll dough into a log. Place log on a piece of plastic wrap wrap tightly. Place log on a baking sheet. Repeat with remaining dough and filling. Remove logs from refrigerator and remove plastic wrap. Slice dough into 1/4" slices and place 2" apart on an ungreased baking sheet. Bake in a 375 degree preheated oven for 10-12 minutes. Remove from baking sheet and cool on a baking rack. I'm not sure when I became a fan of gingersnaps, but it most certainly hasn't been my entire life. So, any time I have the opportunity to try a ginger cookie.... I will. My default favorite are the Trader Joes version. They are delightfully small but have chunks of ginger in them. So what makes this cookie special? Well, I'm not going to lie to you. It's a lot of sugar. They end up being so sweet you can really only have just one. Not always a bad thing for someone like myself who lacks self control. I initially came across this recipe in Yankee Magazine from Jerrelle Guy. The original recipe was a bit different. I made some concessions to make life a little easier for myself. If I'm being honest, I was really just in it for the gingersnap and the dipped chocolate. I didn't want to futz with marshmallows. cookie // the cookie itself is delicious. my version ended up being thin and almost a bit lacey. size // the original recipe yields about 24 cookies. I made my cookies a bit smaller in size and ended up getting about 32.
marshmallow // I opted to use fluff instead of toasting marshmallows. This was super super easy - but it did make them a bit extra sugary. chocolate // original recipe called for a semi-sweet chocolate. I went with white chocolate for two reasons: (1) I like white chocolate and (2) I had this very accessible on hand. That being said, I am atrocious at melting chocolate. I never get it thin enough or glossy enough. In a medium bowl, whisk flour, baking soda, and spices. In a stand mixer, combine the butter and sugar and beat until smooth. Add the applesauce, molasses, grated ginger, and vanilla. Combine until smooth. Gradually combine the wet and dry ingredients. Once you've got it well mixed, add to a container suitable for the refrigerator. Refrigerate for between 1 hour and 2 days. Preheat the oven to 375F and line a cookie sheet with parchment. Roll the dough into 1 inch balls and place on the cookie sheet about 3 inches apart. Bake cookies for about 10 minutes until golden. Remove them from the oven and whack the sheet on the counter to flatten the cookies. Return the cookies to the oven for about 3 more minutes until the edges are browned. Remove from the oven and let cool. match up your cookies so you have even, well-matched pairs for the sandwiches. Smear a thin layer of fluff on one half of the cookie. Do your best to get it out to the edges so you can see it. Sandwich the cookies together. Dip each cookie in melted chocolate. Set to the side and let the chocolate set. Cold weather immediately calls for chili. I like chili for the meat and the comforting meal. I'm not in it for the spice or heat. I am however completely in it for the shredded cheese. It's like the "make your own sundae" of soups. I did a sweet potato and kale soup at some point last winter. While it sounded like a good idea, the sweet potato became rather over powering.... and bland. The recipe was so mediocre that I never even wrote it up for posterity. That has to say something. I really wanted to keep this sweet potato vibe going but knew I had to be conscious of this experience. Since the potatoes were going into the soup, roasted them for added flavor was not going to be a great solution. Instead, I just "zoodled" them into much thiner and smaller pieces... and only used about 50% of what the original recipe called for. The end result was a success. The sweet potato was definitely in the chili but by no means overwhelming or bland. The heat was on par for my kitchen but could easily be amped up with extra seasoning or jalapeno. I always keep the jalapeno seeds out because I'm a baby. Just like with any chili, part of the magic comes from the toppings. I'm not sure who eats naked chili, but it certainly isn't me. In this case, I went with sour cream, cheddar cheese, and red onion. Additionally, I avoid adding salt in my recipes during cooking so that it can be added by each person individually. My grandfather is on a low sodium diet ... and well so should the rest of the world probably. Heat oil in a large pot over medium heat. Add onion, jalapeno, and garlic and sauté until onion is tender and translucent, about 6 minutes. Add turkey meat and brown, breaking up with a wooden spoon. Add spices, salt, and pepper and stir until fragrant, about 1 minute. Add tomatoes and their liquid and cook for another minute or two. Add the rinsed beans, sweet potato, and broth. Bring to a boil, lower to a simmer and cover. Cook until sweet potatoes are tender and everything is nice and thick, about 1 hour. The longer you can leave it simmering on the stove the more the flavors will come together. It's the most magical thing about chili. Taste for salt and pepper. Serve with desired toppings. My life is a little different these days so I don't necessarily need "travel friendly" meals like soup as much - but it is just so hard to fight the urge to make soup. When people say they don't like cooking for just one person, I feel like they haven't tried soup yet. It is just the easiest thing to put in the freezer and have again when you don't feel like cooking for one. I found this original recipe from a food instagram account that I love to follow. Despite wanting to eat a bit healthier, I have a hard time resisting a meat based soup. They are just so filling and satisfying. I often want to try and be more vegetarian but an enticing soup like this keeps me from trying harder. I did make a couple modifications to the original recipe to keep my life a bit easier. ground pork instead of Italian sausage // I absolutely hate removing sausage casing. It is the worst. So instead I grabbed some ground pork and then added additional seasoning to it (thyme, clove, nutmeg, pepper). I was really satisfied with this approach and will absolutely do this again. skipped the cream // I absolutely overlooked this ingredient when I was making my shopping list... but I'm not that upset about it. I don't really love cream based soups... unless its a pure tomato soup. Skipping the cream keeps the soup lighter and healthier which is a win. Heat a large soup pot over medium-high heat. Add the chicken stock, crushed tomatoes and tomato paste. Whisk until tomato paste is fully incorporated. Bring to a boil, season with salt then simmer for 15 minutes. Add the kale and tortellini. Simmer for 3-5 minutes until the kale is wilted and the pasta is tender. Serve with parmesan cheese and red pepper flakes if desired. At some point before Thanksgiving I discovered the "Great British Baking Show" on Netflix... and since then I haven't really looked back. I like it so much that I won't watch it as I'm falling asleep because I need to pay attention to who is star baker and who doesn't quite measure up each week. So when I was planning a little brunch for some girlfriends, I wanted to raise the bar from my default (but creative) scone offering. I also wanted it to be approachable. While I love each recipe challenge on the show, sometimes they can be a bit much for a casual Sunday brunch in fuzzy socks. And that is how I ended up making a raspberry frangipane tart. This recipe is literally beyond easy. While we were sitting around enjoying the spread, someone asked me how it was on scale of 1 to 10. I think it's a 3 if you use a store bought crust. It's a 5 if you make the crust from scratch and it's your first time making crust. But also making crust is easy. You just need faith ... and to follow the steps. Place the flour and sugar into a food processor and give a quick pulse to combine. Cut the butter into small cubes and add to the flour and sugar. Pulse until mixture resembles a course meal, about 10 seconds. With the food processor running, gradually add the egg yolk and then the ice water. Process until the dough just comes together. Using hands, form a rectangular disk with the dough and tightly wrap with plastic wrap. Chill dough for at least one hour. Roll dough on a floured surface into a 16 x 6-inch rectangle. Line the tart pan with the rolled dough and fold over the edges to fit. Press the edges of the pastry into the tart pan. Preheat your oven to 375° F and bake the tart shell (no need for pie weights) until it is lightly golden. If the shell puffs up while baking, carefully use an offset spatula to gently press them back into the pans. Repair any cracks that may have formed with your leftover dough. Cool the shell on a rack while you prepare the rest of the tart. Cream together the butter and sugar on medium high speed with a stand mixer. Add the egg and egg white and mix again on medium speed. Add the almonds, rum, cornstarch, and vanilla extract. Beat together until smooth. Cool on a rack for about an hour for frangipane to set. Decoratively add the raspberries in rows on the tart and sprinkle a light dusting of powdered sugar on top. Serve chilled or at room temperature. I haven't been cooking nearly as much in recent months so when I saw my friend Becca was coordinating a cookie swap.... I signed up fast. I needed a push to experiment... and what better than to try and impress strangers via the mail. This recipe is a combination of two forces. One? I did win my office Christmas cookie contest last year. So, I didn't want to put simple chocolate chip cookies in the mail. Two? I've been watching a lot of the Great British Baking show on Netflix. So in my head I was giving myself some Paul Hollywood criticism about imperfect shape and not perfect chocolate melting skills. All true facts. I've never been interested in perfect cookies and never been good at melting chocolate. I'm not sure exactly where I found this recipe on the internet but I'm glad I did. I've never cooked with matcha before. To be honest, I sometimes love the flavor and sometimes do not. These cookies are just small enough to be a good balance in my opinion - especially when coupled with the white chocolate. I'm a sucker for white chocolate. The original recipe I was referencing had these cookies being piped out. I think this batter is way too thick for that. If you want to do that, I think you need to make some modifications to the flour ratios. I tried to do one and then called an audible. Not a fan of white chocolate? No big deal. Dip them in any other flavor. I think it would also be great with some nuts too. 1. Line 2 large baking sheets with parchment. Sift flour with matcha in a medium bowl. 2. Beat butter, sugar and salt in a large bowl, using an electric mixer on medium-high, until fluffy. Beat in egg. Reduce speed to low and gradually beat in flour mixture until just combined. Dough will be firm. 3. Spoon the batter onto some plastic wrap or wax paper. Shape into a long cylinder. Wrap securely and refrigerate for 10 to 15 min. Dough can be prepared and refrigerated (or frozen) for several days in advance! 4. Preheat oven to 350F. Slice the dough into small slices, like ¼ inch or so. Place on a cookie sheet with about 2 inches in between. 5. Bake until you begin to see an itty bitty bit of light brown on the edges. Depending on thickness the time may vary between 10- 15 min. Cool on sheets for 5 min. Transfer to a rack to cool completely. Repeat. 6. Melt chocolate until completely melted and smooth. Dip half of each cookie in chocolate, shaking off excess on edge of bowl. Place on parchment-lined sheet and sprinkle candy balls over chocolate. Refrigerate until chocolate is firm, 30 min. Store cookies in an airtight container for up to 1 week or freeze for up to 1 month.